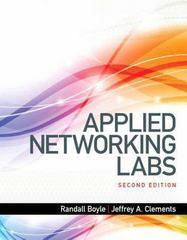 Applied Networking Labs 2 Edition For undergraduate and graduate networking and telecommunications courses that use hands-on labs. This text is also appropriate for anyone interested in understanding the installation and basic operation of software used in the field of networking. Gain hands-on experience working with networking tools Applied Networking Labs guides readers through the installation and basic operation of software used in the field of networking. Using this book in conjunction with a traditional Networking textbook will greatly reduce the time and effort required to prepare a course. It will also get students excited about the course and give them hands-on experience using various real-world networking tools. Teaching and Learning Experience This program presents a better teaching and learning experience—for you and your students. It will help: Make the connections: The Chapter Map aligns chapters in Applied Networking Labs to chapters from several popular networking textbooks so instructors and students can see which projects correlate to the content being presented in class. Gain real-world experience: Approximately 80 hands-on projects give students real-world experience using actual software that may not be presented in a traditional textbook. Get the picture: Project Screenshots will be unique due to who is taking it and when it is taken—any sharing or cheating will be obvious. Access further resources: The Website for this book contains useful resources, links, and files. Keep your course up-to-date: This edition is Microsoft Windows 7® Professional compliant, contains a Microsoft Windows Server 2012® chapter, expanded Linux coverage, and updated software versions for all projects.